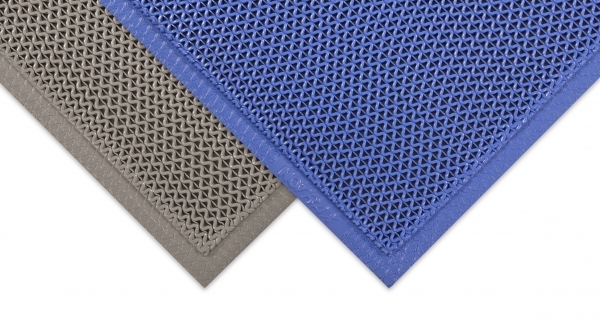 Superior Manufacturing Group has introduced Web Trax, the newest addition to the NoTrax family of floor matting products. Web Trax is a multi-functional vinyl floor mat that can be used in a variety of wet applications. The unique wave pattern design creates a slip-resistant walking surface while an open construction allows for easy drainage of liquids further increasing traction on wet and slippery floors. Web Trax is made from an industrial grade vinyl compound that is soft enough to be comfortable on bare feet in applications such as locker rooms, pool decks and shower facilities, yet also provides greater resistance to caustic chemicals, oils and greases for use in more industrial environments. The PVC material has an antibacterial treatment that prevents the growth of fungi or bacteria and is also UV resistant making Web Trax the perfect choice for both indoor and outdoor environments.